Ashley is fully articulated, has realistic hair and a fun-to-play-with wardrobe for herself and her Breyer model horse. 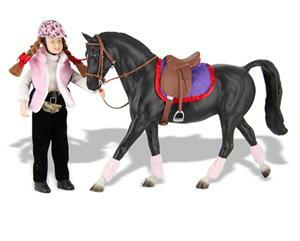 She comes with removable hair bows, riding chaps, breeches, outerwear vest and riding helmet. A Breyer model horse can be tacked up with special leg wraps and an eye-catching satin-trimmed, quilted saddle pad, included. Note: Horse and some accessories not included.